At left you can see what used to be the 40-160m vertical, and the centre feed point of the 160m dipole. Beneath the vertical is the upper dipole of the 6m phased array which points north to the mainland. Recently added, home brew 2m beam. Directed north for working across Bass Strait to the mainland. 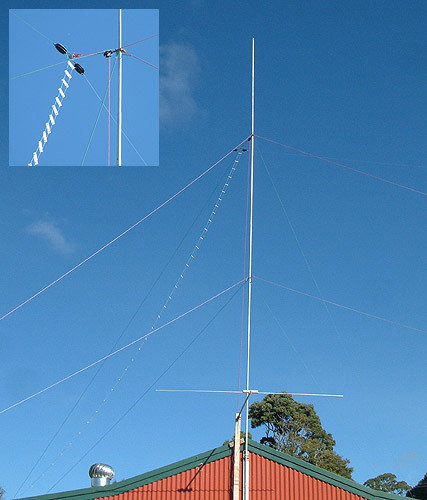 A home brew 3 element vertical collinear array for 2m. Works almost as well as the beam above... but no local repeaters, as the shed wall reflector cuts off all but the north. Another recent addition... a home brew 70cm beam for better access to the local repeater on Table Cape.